Perhaps one of the greatest challenges that accompany the incredible advances in science and technology is making them accessible where they need to be. According to the Amputee Coalition of America (ACA), there are over 2 million American amputees, with an additional 185,000 lower extremity amputees every year . In Africa, Asia and Latin America, where incomes are lower and fewer people are insured, there as many as 30 million amputees. Only a fraction of the world amputee population has access to a prosthetic limb, let alone can afford anything considered state-of-the-art. In order to help address the huge demand, the non-profit organization 2ft Prosthetics has developed a low cost alternative prosthetic foot to be distributed in developing countries, referred to as the OneSize foot. This study serves as a preliminary investigation of the ergonomics of this design and makes a comparison to carbon fiber prosthetic feet sold by certified vendors. Using motion-tracking technology, the gait cycles of volunteer amputees were measured and analyzed for potential improvements in the design to produce a more natural gait for walking. The results in this report are derived from a right below-knee amputee. The setup included calibrating 10 infrared cameras to focus on a volume of space through which the volunteer amputee would walk back and forth at a comfortable pace. Two force plates were situated in the middle of the control volume space, over which the volunteer would walk by placing one foot on each plate. After strategically placing reflective markers on the volunteer, several walking trials were recorded using Vicon motion capture tools. The volunteer performed this first with the OneSize foot, then repeated the operation with their personal carbon fiber foot. Markers were placed symmetrically on the right (prosthetic) and left (contralateral) limbs and were replaced when switching between the two prosthetic feet. The vertical position averages of three clean trials are shown in the graphs below, along with vertical force plots. They reflect the markers placed on the Right/Left Anterior Superior Iliac spine (RASI/LASI), the Right/Left Lateral Knee (RLKN/LLKN), and the Right/Left Distal Dorsal Toe (RDDT/LDDT). The portion of the gait cycle that includes ground contact (heel strike to toe off) may be simplified to three types of rocker motion: heel rocker, ankle rocker, and forefoot rocker . 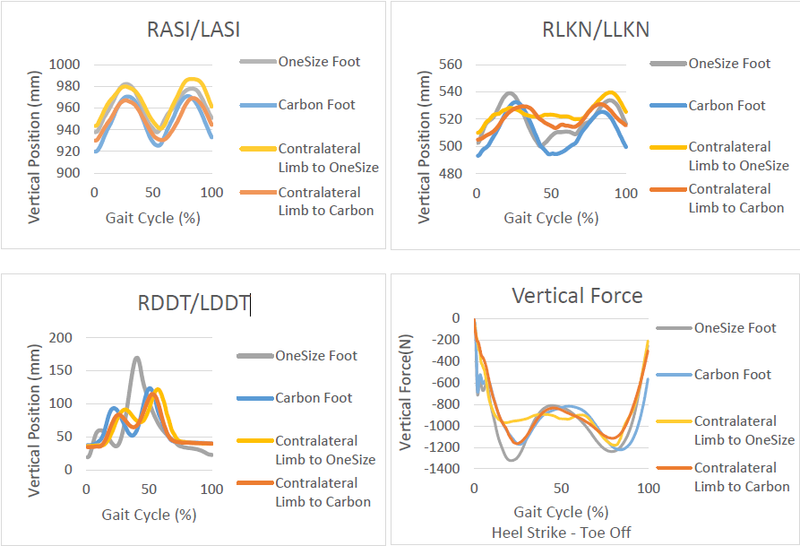 From the vertical force graph, it shows that the transition from heel rocker to ankle rocker (approximately 15-40%) is substantially different between the left and right feet with the OneSize foot. A likely cause is that the OneSize heel strike is not dampened enough and that the “ankle” portion is too stiff. The rest of the gait cycle does not appear to vary as much, suggesting that there is enough flexure in the forefoot. Although the offset vertical position trajectories may be attributed to marker placement, it may also be a sign of an overall stiffer lower extremity. Modeling the motion in a 3D application such as OpenSim would help with interpretation. Follow up trial runs with additional volunteers would also increase the statistical significance of this study and help with seeing trends. In addition to motion tracking, future studies of gait efficiency can be measured using EMG, oxygen consumption, and activity logs over an extended period. Leimkuehler, Paul E. “THE THREE ROCKERS OF THE FOOT.” American Academy of Orthotists & Prosthetists, n.d. Web. 26 Aug. 2016.